Nearly everyone who has a shower uses shower doors of shower curtains. 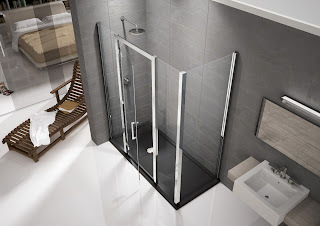 While shower curtains are quite frequently used in combination with a bathtub, many people make use of shower doors if they have a separate shower enclosure. They have a few advantages. First of all they are watertight, but they also look much more elegant and usually let much more light pass into the inside of the shower. This allows for a much more comfortable and natural feeling inside the shower. These doors come in various variations. They can either consist of plastic or glass and they come with frames or without them. The frameless type made of glass looks very elegant and has become very trendy recently.